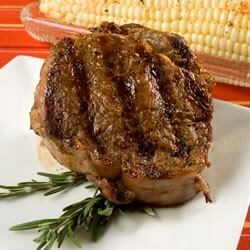 "A very flavorful steak as good as the ones you pay $30 for in the restaurants. Serve with sauteed mushrooms and a baked potato." Rub each steak lightly with olive oil - this is to ensure that the steaks don't stick to the grill. Season with salt and pepper. Rub fresh garlic into both sides of each steak. Let stand for 15 minutes. Place the steaks on the preheated grill, and immediately turn after 30 seconds (this first turn is to ensure that one side is seared). Place the fresh rosemary sprigs on top. Cook 7 minutes per side, to desired doneness, remembering to remove the rosemary sprigs before turning, and to replace on top of the meat after turning. My husband and I LOVED it!!! I used dried rosemary instead of fresh. The only problems was my kids wanted the "dirt" off the steak, haha. Cant please everyone! This was very good. I let them sit in the fridge for about an hour (with rosemary on top) after seasoning them. I also added the zest of a lemon to the ingredients.